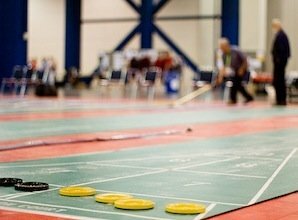 Shuffleboard is a game of disputed origins that probably began around 500 to 600 years ago in Europe. It involves using paddles to “shove” pucks towards a target area and there are many variants within the game, as well as alternative names, including deck shuffleboard and shovel-board. King Henry VIII was a big fan of the game and especially betting on it! It has similarities to many sports, most notably bowls, curling and, in its table form, air hockey. In this article we are concerned solely with shuffleboard itself. The object of the game is simply to use the paddle to propel the weighted pucks into the scoring zone in order to win points. Shuffleboard is played by either two players (singles play, one against one) or four (doubles, two against two). It is played on an outdoor court measuring 52 feet long by 10 feet wide, although there are different dimensions available on new portable and indoor courts. The court has scoring triangles at either end beyond which is a further six feet for players to stand whilst playing towards the other end. The triangle is divided into point zones with 10 at the tip, nearest the players, then eight, then seven, the latter two with a central division creating a left and right area. At the base of the triangle is the “10 OFF” penalty zone. The players use a paddle-like stick called a tang to propel the pucks (called biscuits) towards the scoring triangle. The tang, or cue, cannot be longer than 6ft 3in. The player who goes first (usually decided by coin toss) uses the yellow biscuits with the player going second using black and the biscuits are six inches in diameter and are no more than 1in thick. Players alternate “sending” the biscuits with the aim of getting as many into the scoring zones as possible. Scores are counted only after all eight (four each) pucks have been shot and the puck must be wholly inside the scoring zone to register – those touching the line do not count. It is legal to aim your own shots at a player’s puck with the goal of removing them from the scoring zone or even into the 10 OFF zone, for which a player receives a penalty of minus 10 points. If a player’s puck is on the 10 OFF line then the player receives a five point penalty. Players also lose 10 points if they shoot the biscuit off the court, including if touching the side line. The winner is the first to reach a pre-defined target, usually 75 points, or the player with the highest score after 10 complete rounds, whichever comes first. If both players or sides reach 75 on the same turn then the player with the highest score shall be the winner. The player to go first is decided by a coin toss and then the player who scored highest in the previous round goes first. Players shoot one puck at a time and take alternate goes. One smooth continuous forward motion must be used to shoot the puck and no “hook” shots are allowed. Playing another player’s disc receives a 10 point penalty. Player must wait until the preceding player’s biscuit is stationary before playing their shot. Play begins at alternating ends so you start at the end of the court at which the previous game finished.